Who Is Reza Zarrab and Why Turkey So Obsessed With Him? Who Is Reza Zarrab and Why Is Turkey Obsessed With Him? Turkish-Iran businessman leaves a police department after Turkish probe into corruption. After months of wait and diplomatic talks, a major U.S. trial that involves several Turkish defendants — Mehmet Hakan Atilla, former deputy CEO of state-run Halkbank, Turkish-Iranian gold trader Reza Zarrab and several other people in absentia — has finally begun this week. The Zarrab trial, as it is known in Turkey, appears to be at the center of an enduring schism between Ankara and Washington. The trial has already put a strain on relations between Turkey and the U.S., with fears dogging Turkish political landscape over potential financial ramifications, and even crushing fines that could affect the Turkish economy. The process started when Mr. Zarrab entered the U.S. in March 2016. He was detained by Federal Bureau of Investigation agents in Miami. The case later expanded to include other Turkish citizens, such as the three executives of Halkbank. The U.S. prosecution focuses on a multibillion-dollar scheme developed by Mr. Zarrab and his associates that involved the use of Turkey’s state-owned and U.S. banks to help Iran circumvent severe restrictions on access to the international financial system imposed in the early 2010s due to Tehran’s nuclear program. Mr. Zarrab, on behalf of Iran, pursued an oil-for-gold arrangement that allowed Tehran to import oil and gas to lower its trade deficit. The scheme had reportedly involved senior Turkish government members. Former Turkey’s economy minister has been accused of taking millions of dollars in bribes to abet Mr. Zarrab in his scheme. U.S. prosecutors claim that the defendants used front companies and fake invoices to trick U.S. banks into processing transactions that looked like they involved sanctions-exempt food items, according to Reuters. “High-ranking officials in Iran and Turkey participated in and protected this scheme. Some officials received bribes worth tens of millions of dollars paid from the proceeds of the scheme so that they would promote the scheme, protect the participants, and help to shield the scheme from the scrutiny of U.S. regulators,” the prosecutors alleged in the indictment. Mr. Zarrab had been kept in a federal jail in New York City since March 2016. Recently, he has been moved into federal custody, after agreeing to cooperate with the prosecutors. Turkish Prime Minister Binali Yildirim said the gold trader has become a witness in the trial. “You arrest the general manager of my bank when there are no crimes, try to use my citizen [Zarrab] as an informant, try him without having anything against him,” Mr. Erdogan said earlier this month. The roots of the charges that Mr. Zarrab faced go back to late 2013, when Turkish prosecutors initiated a wide-ranging probe into a number of paramount figures of the business world, family members of cabinet ministers and senior Justice and Development Party (AKP) politicians. On December 17, 2013, Istanbul and Ankara police simultaneously raided multiple addresses in both cities and arrested 52 prominent figures. The sons of Interior Minister Muammer Guler, Economy Minister Zafer Caglayan and Environment and Urban Planning Minister Erdogan Bayraktar were among those detained. Mayor of Istanbul’s Fatih Municipality, Mustafa Demir, prominent businessman Ali Agaoglu, state-run Halkbank CEO Suleyman Aslan and Turkish-Iranian businessman Reza Zarrab were also among the people in custody. 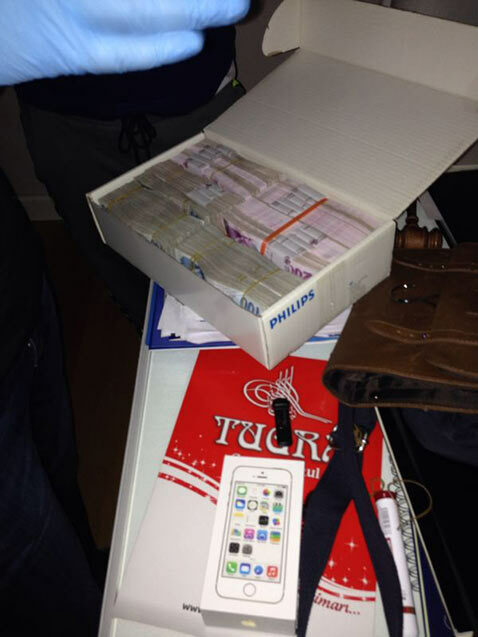 Police discovered $4.5 million stacked in shoeboxes in the house of Halkbank CEO Mr. Aslan. 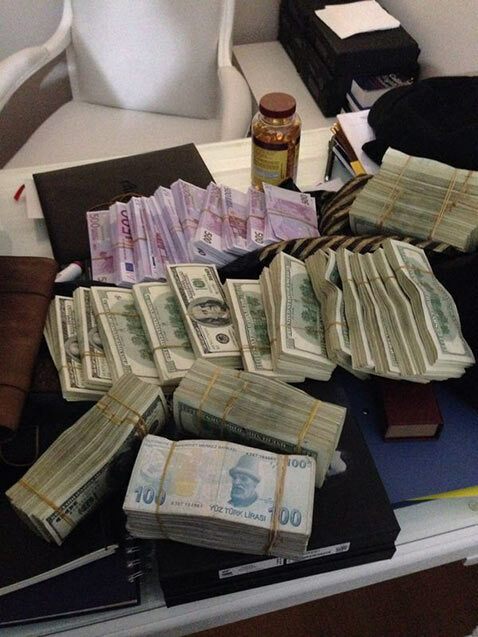 They also found a money cashier in the home of Interior Minister Muammer Guler‘s son. When the scandal first broke, it shook then-Prime Minister Erdogan’s government to its roots, shattering the country’s political landscape. For the next two years, the corruption files and later defunct investigation had been the major topic in Turkish politics. On the day of raids, Prime Minister Erdogan declined to comment on the arrests of sons of his three ministers, citing the ongoing legal process. Istanbul Governor Huseyin Avni Mutlu also rejected to offer any comment. In an unexpected move that week, Minister Bayraktar, speaking to NTV Channel, refused to take any responsibility for tender rigging claims and other misdeeds that took place at his ministry. “I do not [accept that] because a big part of the zoning plans that are in the investigation file and were confirmed were made with approval from Mr. Prime Minister,” Hurriyet daily news quoted the minister as saying. The first wave of the graft probe resulted in cracks within the ruling AKP. Spokesman Huseyin Celik showed respect for the ongoing legal proceedings, while others were enraged with the probe. Finance Minister Mehmet Simsek said he would resign if he faced similar corruption charges. The police chiefs who launched the inquiry and conducted raids were immediately sacked by the government. The government began to formulate a political strategy to contain any fallout from the corruption investigation and to ward off any political damage from the revelations. At the time, the government started to use the term “parallel structure” and “parallel state” to describe Gulen sympathizers within state bureaucracy, claiming the existence of a separate power source outside its control. The opposition at the time did not buy that narrative and portrayed government’s purge of prosecutors as a coup against the judiciary. Main opposition Republican People’s Party (CHP) Chairman Kemal Kilicdaroglu and Nationalist Movement Party (MHP) leader Devlet Bahceli were quick to demand Mr. Erdogan’s resignation. “Turkey must confront corruption,” then MHP leader Bahceli said in his initial remarks on the case. “The operation in Istanbul once again showed that this government was involved in illegal activities and that it has become the epicenter of questionable ties based on greed, interests and the abuse of public resources,” the MHP leader said. Turkey turned into a country of corruption, poverty and bans under the rule of Prime Minister Erdogan, he went on to claim. Pro-Kurdish People’s Democracy Party (HDP) co-chair Selahattin Demirtas also called for the prime minister’s resignation. After a day of shock, Mr. Erdogan began to push back, blaming the police for the corruption investigation, “aiming to tarnish Turkey’s most successful public banks.” His government dismissed the probe as an attempt to remove an elected leader from power through illegal methods. In a display of defiance of the probe, he appeared along with his ministers on the top of a party bus, expressing solidarity with the accused ministers. The operation to curb suspicious money transactions between a number of Turkish and Iranian companies began in 2011. There were at least 11 companies in total that facilitated gold purchase from Turkey and managed money transfers, which reached $87 billion between 2009 and 2012. Bank Mellat, 40 percent of which is owned by the Iranian government, was a key actor on the Iranian end of transactions, while the companies built solely for this scheme used the Turkish banks of Aktif Bank, Deniz Bank, Kuveyt Turk and Garanti Bankasi for their financial operations. The gold trade had been on the radar of the Turkish media. The Aksam daily reported about it in early 2013 when Mr. Zarrab was caught with gold at Ataturk Airport. YeniSafak ran a similar story. Police intensified its technical surveillance of Mr. Zarrab after the incident. The corruption probe took the shape of a three-pillar investigation into public tender riggings, construction sector, and into sons of ministers. The latest part solely focused on Halkbank, Mr. Zarrab and clandestine financial ties with Iran through a certain scheme. Mr. Zarrab faced accusations of involvement in export fraud through forgery of documents, money laundering, and bribing Turkish ministers for advancing his scheme. He also allegedly acquired Turkish citizenship for several foreigners, for his family through then-E.U. Minister Egemen Bagis. Iran had a policy at the time of acquiring large amounts of gold from Turkey in an oil-for-gold framework. The mass purchase of Turkey’s gold was undertaken by rich Iranian families living in Turkey, including Mr. Zarrab and his companies. Halkbank appeared at the center of the illicit trade that helped Iran to circumvent international sanctions. 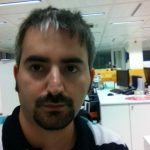 Mr. Zarrab’s assistant, courier Adem Karahan explained in detail the murky money relations, and how Turkish ministers enjoyed exploiting the scheme through millions of bribes. Mr. Zarrab had close ties with the Erdogan family. He attended charity events hosted by Emine Erdogan, Prime Minister Erdogan’s wife, and had contributed handsomely to TOGEM, an organization run by Mrs. Erdogan. Emine Erdogan shakes hands with Ebru Gundes, wife of Reza Zarrab (R) at an event. On one occasion, Mrs. Erdogan even gave an award to Mr. Zarrab who was believed to have donated millions of dollars to the charity organization of the Erdogan family. First Lady Emine Erdogan gave an award to Reza Zarrab (L) for his contribution to charity activities in education. Prime Minister Erdogan himself praised Mr. Zarrab as a “very good and honest businessman,” in remarks to reporters on Dec. 26, 2013, more than a week after the scandal swept into public view. He said Mr. Zarrab contributed to the country very positively. A year later the Turkish government awarded him as the year’s exporter for his contribution to the economy, while pro-government media hailed him for reducing Turkey’s current account deficit. 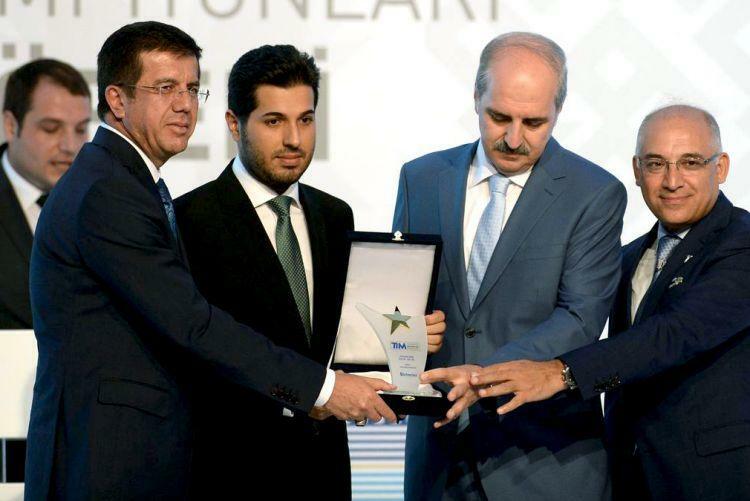 Economy Minister Nihat Zeybekci (L) and Deputy Prime Minister Numan Kurtulmus (R) hand the award to Reza Zarrab (C). When Mr. Zarrab was first detained in Miami last year, the Turkish president tried to distance himself from him, saying that the issue had nothing to do with Turkey and had no importance for Turkish national interests. But later, he defended Mr. Zarrab as an innocent man and began to portray U.S. accusations against him as a plot against Turkey. In late 2013, Istanbul Prosecutors overseeing the probe sent a request to Turkish Justice Ministry to be submitted to Turkish Parliament for lifting the immunity of the four ministers implicated in the probe. But he was purged from his post after the government moved to reshape the structure of High Council of Judges and Prosecutors (HSYK), the top judicial body responsible for appointments of judges and prosecutors, and took disciplinary actions against them. The government stopped the motion seeking the lift of immunity of the accused ministers. At a later date, it was submitted to the parliament only to be defeated by votes of the ruling AKP, which had the majority. On December 25, a separate corruption probe, which was also dubbed as the second wave, rattled the nation as prosecutors tried to summon Bilal Erdogan, Prime Minister’s son. After days of deliberations with party bigwigs, Mr. Erdogan accepted resignations of ministers ensnared in December 17 graft inquiry. He launched a major cabinet reshuffle, replacing 10 ministers to solidify his grip on the party and to hammer out war strategy to scotch the probe. New Interior Minister Efkan Ala and new Justice Minister Bekir Bozdag took the lead in government policies to crush the investigation and purge police chiefs and prosecutors. The opposition was incensed by the government efforts to curb the ongoing legal process. “We have entered an era where the thieves are being protected and prosecutors who are going after the thieves are rendered ineffective,” CHP leader Kilicdaroglu said. In his initial reaction, Finance Minister Simsek said the dismissal of police chiefs was not the right action if it meant obstruction of justice. “This issue is the judiciary’s matter now. The final decision will be given by that body,” he said at the time. Prominent commentator and Economics Professor Mehmet Altan, who is now in jail, called the Turkish government’s crackdown on the judiciary and killing off the investigation as a coup against the legal system. For the first time in republican history, he noted, a government staged a coup against bureaucracy, crippling its institutions and judiciary for its political survival. Turkish authorities dismissed, suspended or re-assigned several thousands of senior police chiefs and arrested corruption investigation prosecutors. In the first political test since the incident, Mr. Erdogan’s party saw a sharp decline in votes in March 2014 local elections but still managed to hold Istanbul, Ankara and many other major cities under its sway. Turkey-U.S. relations have been locked in a discord over Mr. Zarrab trial. For President Erdogan who somehow weathered the storm of graft scandal and thwarted any legal threat to him at home, the Manhattan trial contains potential politically explosive material that would harm the Turkish economy. Experts believe that Mr. Erdogan fears potentially damaging revelations during the trial that could detail Mr. Zarrab’s connections to his family. But more than that, any findings that confirm that the evasion of U.S. sanctions on a massive scale would not have happened without him somehow turning a blind eye to Mr. Zarrab’s scheme would be far more catastrophic. Earlier this month, Mr. Erdogan told Turkish reporters that Ankara was not a part of U.S.-led sanctions against Iran at that time, and therefore the gold trade could not be regarded as sanctions evasion. Last month, Haberturk daily reported that the Turkish officials fear U.S. would levy on heavy fines on Turkish banks. Whether that can become true or not will be seen at the end of the trial.